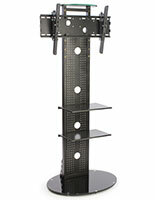 Have you worried that glass TV stands are too fragile for commercial use? Many elegant contemporary mounts have a modern style and clean design that can be deceptive. 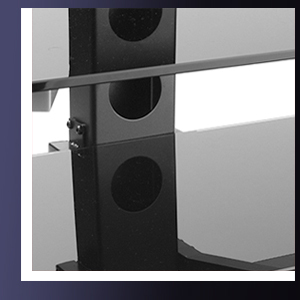 Our tempered glass TV stands are made from high quality, durable materials that can withstand heavy use in high traffic offices or public areas while still being stylish enough for residential use. 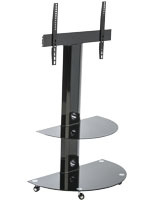 Designed to securely hold flat screen televisions and monitors, these fixtures include shelves for holding peripheral equipment and even supplies. 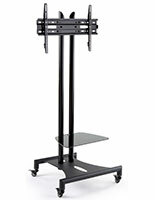 Commercial grade glass TV stands, sometimes known as office entertainment centers, are available in a variety of styles to match any office or home environment. 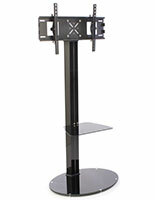 From freestanding pedestal bases to table-style display furniture and enclosed cabinet bases, modern style mounts are ideal for use in locations where portable or lightweight stands may not be appropriate. Where are commercial-grade entertainment centers commonly found? 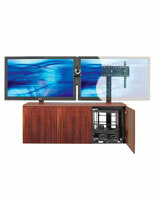 Tempered glass TV stands, especially table or cabinet-style designs, are ideal for home or residential use. Sleek, contemporary construction can complement any living room, den or even an equipment-packed "man cave." 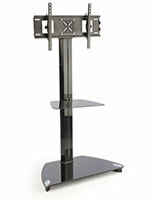 A monitor floor stand with modern design will also complement a variety of office of business environments. A glass TV console is a perfect addition to waiting rooms, as well as an obvious choice for executive conference or meeting rooms. 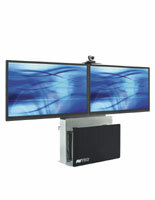 Heavy duty metal mounts easily support widescreen monitors for use in video-conferencing, tele-learning or presentations. 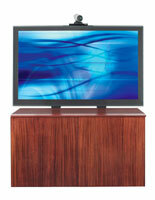 This type of display furniture can function as much more than a simple entertainment center as needed. 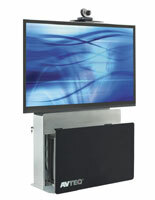 Upscale retail environments offering digital signage displays frequently choose a glass TV console to showcase advertising or marketing multimedia materials. The sleek, contemporary design can complement many different styles of décor, making the electronic entertainment centers part of the visual experience for customers. In addition to tempered glass, these modern style fixtures incorporate a variety of metals including steel, aluminum, MDF and traditional wood. In addition to differing designs, available options (depending on the model) include locking storage cabinets, rounded shelving, internal rack-unit storage and adjustable height. 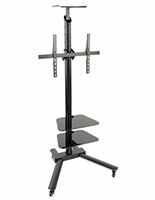 In addition to durable construction, each monitor floor stand offers easy accessibility to installed fixtures and accessories, cord-management options and exceptional mount stability. 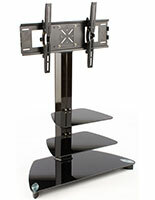 All brackets are VESA-compatible to ensure a perfect match to television screen size. 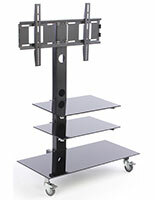 Our commercial flat-screen display furniture ranges from the strictly utilitarian to the elegant. 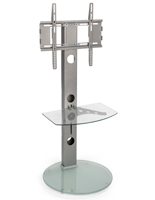 These modern style glass TV consoles are more than simply mounts for monitors or televisions. The sleek look and eye-catching design of this type of high-end entertainment center makes each fixture as appropriate for residential use in home theaters, living and family rooms as for business use in waiting and conference rooms or private offices.